The poet narrates the poem through the eyes of a traveler who seems to have come back from a remote and far-away land, referring to Egypt. The traveler recollects what he saw there in the desert: a large mangled statue. The statue had two massive legs but its upper body or torso was missing. The second part of the statue was strewn across the sand – it consisted of a huge face. The face was grinning in displeasure and held a sarcastic smile, and wrinkled lines were still evident on the face. The sculptor has had done a fantastic job of capturing emotions from the King’s face to the lifeless statue. The king had brutal expressions and the sculptor mocked the same on the stone. Just below the huge legs, on the platform were written the following words – My name is Ozymandias, king of kings: Look upon my works, ye mighty, and despair! By these words the king was introducing himself as Ozymandias – the most powerful king in the world. He was telling other kings of the world to bow down before his huge statue. The entire statue had been broken, withered with the sun and rain, only the message engraved was intact. The lying statue was seen lying in the desert – opposite to standing tall. However, it’s not seen as something standing tall in the desert. With time nothing remains same and forever. 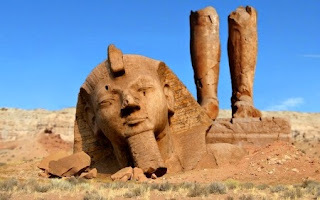 Things come and go – so did the king Ozymandias and his statue.